Marriage is constantly evolving. What hasn't necessarily evolved, however, are many wedding traditions, especially when it comes to what's expected of grooms. "There's something to be said for tradition," Jeff Wilser, editor of The Plunge -- a one-stop-shop for all things groom -- said to CBSNews.com. "Mock all you want, but traditions are, to some extent, a token of respect and fidelity. A tux for the groom is like a tree for Christmas, it's just 'what we do.'" Some grooms may be clueless of what's expected, from asking her pop for "permission" to what you should get your beloved for her "bridal gift" -- yes, grooms are expected to give their brides something the day of the wedding. Wilser, author of "The Maxims of Manhood," is founding editor of The Plunge, a site that's motto is "A spoonful of sarcasm helps the wedding planning go down." Despite never getting married himself, he's become a groom's guru, and has also written for GQ, Glamour, Esquire and The Knot, and even fields questions from future grooms on his site. "Most guys have a vague sense that there's 'stuff they're supposed to do,' but they're not exactly sure what all that stuff is, and they're looking for a roadmap. We try and give them a roadmap in their language," he says. The wedding ring dates back before 2800 BC, Readers Digest reports, when Egyptians showed their undying affection by placing silver or gold on the third finger of their left hands, believed to contain a vein that leads directly to the heart. Now, it's a symbol of love that will empty your bank account and undoubtedly get plastered on social media for all friends, family and colleagues to see. "The bride will be wearing this forever. FOREVER," Wilser points out. "Everything else about wedding planning is temporary; you blink and the day is gone. If you botch the ring, this will haunt you." Before you go blindly into a store with a bundle of cash, you must have a basic education of engagement ring values and costs. And that all starts with the "Four Cs." Color is graded on a letter scale from "D" to "Z," with a D-diamond being "colorless" -- the best -- working its way towards Z as more color, caused by a greater proportion of non-carbon trace minerals, is present. A diamond with a higher color grade may look more yellow, and therefore is less costly. Clarity refers to the number of blemishes and irregularities found inside a diamond. Many of these blips can't be seen by the naked eye or even by amateur jewelers with a magnifier -- but they all affect the stone's value. A diamond with perfect clarity that is free of inclusions and blemishes is deemed "FL", or flawless. Other clarity grades in order of decreasing diamond value: VVS1 and VVS2 (which reflect different degrees of very, very slightly included), VS1 and VS2 (very slightly included), SI1 and SI2 (slightly included) and I1, I2 an I3 (included, which may affect the diamond's transparency). Up next, Cut, which measures how well a diamond's facets interact with light, or simply, how it sparkles. Cuts include Excellent, Very Good, Fair and Poor, according to the GIA. Wilser points out cut accounts for 50 percent of the diamond's costs. Last -- but by no stretch least important -- is Carat, which is the unit of weight for diamonds. One carat equals 200 milligrams, so, the bigger the diamond, the more carats. Definitions can only get you so far, what do we do with this information? Simply go to the store and demand the finest D-color, Excellent-cut, FL, 2 Ct. diamond? If you have a never-ending supply of money, then go for it. But for most of us, it's a balance between the four C's. If you think a bigger diamond (higher carat) is what suits her, you may be able to sacrifice in other areas. For example, some grooms choose to go with a bigger carat but worse color, or vice versa. Wilser says one area not to skimp is cut. 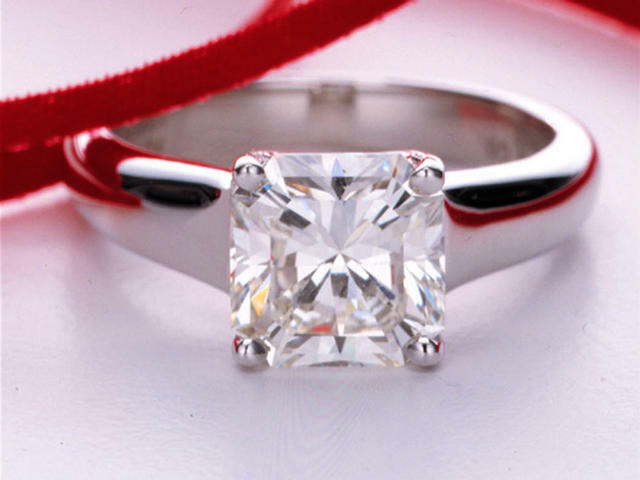 "People focus on size (carat), but a big rock with a bad cut will look cheap," Wilser says. "Cut really strikes at the heart at the quality of the diamond. The better the diamond cut, the rarer the diamond, the more expensive the diamond," he said. You also have to put the diamond on something. When it comes to bands, platinum, white and yellow gold often reign supreme. Platinum can be slightly more expensive than gold, according to Wilser, but that's no reason to fear it. He points out the price gap between the two is closer than ever, and years ago there was a whopping 82 percent difference in cost. Not only that, platinum is less likely to wear over the years. "The spread between platinum and gold has tightened dramatically, to the point where platinum is the smarter buy," according to The Plunge. "Given that it's a more durable metal, and often more desirable, it's no longer an obvious place to save money." But, because this can be a major purchase, some grooms want to make sure they're getting it right by bringing their bride-to-be along to the jeweler. Should you be one of them? Wilser says you should defer to how the relationship has been until now: If you and your love have already mapped out when and where you'll get married, how many kids you'll have and most other steps until your eventual deaths, you may as well bring her along to the jeweler since she likely has a vision of what she wants. If you want the proposal to be a surprise -- even if you've discussed getting married -- Wilser recommends going with an educated guess. Try recruiting a trustworthy friend of hers, or look at her current jewelry to get a sense of what style she likes. While you're in there, grab a ring she wears on her ring finger so you can get it sized by the jeweler. When in doubt while ring shopping, Wilser says to err on the side of simple and conservative, by just getting the best diamond you can in your budget. Speaking of budgets, grooms traditionally have been told to save two month's salary for a ring. Wilser says you don't want to be a cheapskate, but you don't want to go into the poor house either. "If you're living paycheck to paycheck, struggling to make rent, and you're still doing back flips to retire student loans ... you're actually doing your future wife a disservice by hampering your financial security," he writes on The Plunge. But, that doesn't mean you should pass off a cubic zirconium or moissanite ring as real -- after all, do you really want the symbol of your marriage to be a lie, he asks? Stick to what's within your means, and seek out a trusted family jeweler or gemologist to help. If you can't afford a diamond, Wilser recommends seeking out a different, sturdy gemstone like sapphire. Other stones, like emeralds, may be more prone to wear. Ring shopping recommendations can be a lot to take in for future grooms. Wilser's take-home advice? "Try and get a sense -- as tactfully as possible -- as to the kind of ring she's into," he said. "In this day and age, it's unlikely that the proposal will be a total shock. It's possible to get a general 'sense' of what she would like without awkwardly going ring shopping together." Stick with CBSNews.com this week for more information for grooms, and be sure to check out The Wedding Planner for all things weddings.